Writer's block stinks. Like insomnia, I find that the best way to "break through" the block is to distract myself from the problem writing. Sometimes I write something completely different, sometimes I organize my desk drawers, sometimes I make lists. Let's face it, I'll try anything! But one thing that doesn't work for me is reading. Before you know it I'm lost in the book and don't even WANT to go back to the difficult job of creating my own book. But I recently found a book that, because it comes in tiny, bite-sized chunks, offers a brief distraction from writer's block. It's also perfect for when you just have a short time for reading. 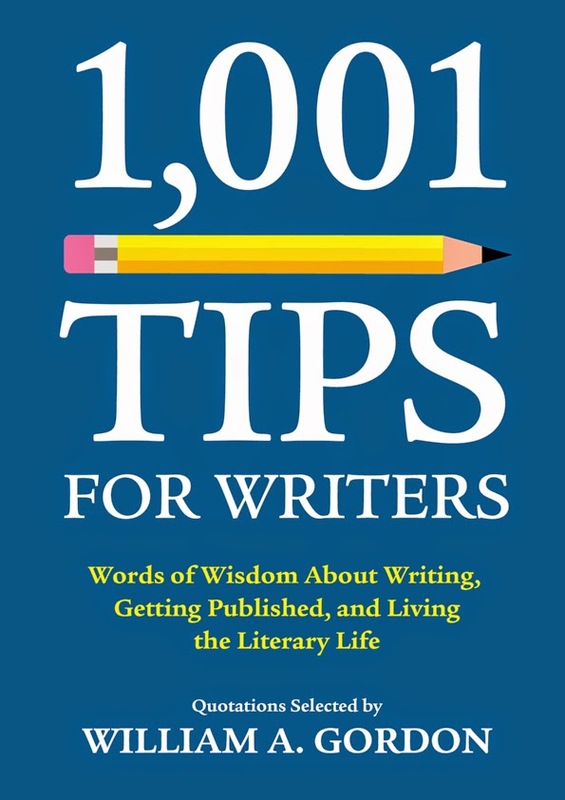 1,001 Tips for Writers: Words of Wisdom About Writing, Getting Published, and Living the Literary Life is a book of quotes from writers, publishers, editors, agents, professors, even a president or two about all types of writing subjects. This book is less than 200 pages but it is jam-packed with tips, truths and encouragement. This book is organized into 44 short chapters with titles such as: Rejection, Writers & Money, Grammar and Critics. You'll find yourself wanting to copy quotes and paste them on your bulletin board or--if you aren't stuck in the last millenium like me--to your Pinterest board. Quotes were selected by author and publisher William A. Gordon. 1,001 Tips for Writers is available as a print and e- book at Amazon and Barnes and Noble. To win a copy of 1,001 Tips for Writers, please enter using the Rafflecopter form below. The giveaway contest closes August 25th at 12:00 AM EST. We will announce the winner the same day in the Rafflecopter widget. Good luck! Jodi--Any book that helps get a writer out of a rut is book that I need. I'll keep my fingers crossed. Best writing tip...stop writing in the middle of the action, either a sentence or scene, so you'll be excited to pick up where you left off the next time you sit down to write. "The worst enemy to creativity is self doubt." What a great book! Good luck everyone! The best piece of writing advice I have ever received was this: Stop procrastinating and write. Write every day and edit another day. The best writing tip I have heard is to write something each day even if it is a little bit.